Sun and clouds mixed. High 73F. Winds light and variable..
A few clouds. Low near 50F. Winds SE at 5 to 10 mph. From left, Elvis Martinez talks with friend and Realtor Tami Gooding while looking at a house for sale Sept. 4 in Twin Falls. Katie Mitchell, formerly of Fargo, N.D., helps move her family's belongings into a new Burley rental home on Aug. 30. Katie Mitchell watches as workers from a moving company unload her family's household goods in Burley on Aug. 30. Katie Mitchell marks off items on a clipboard on Aug. 30 in Burley as her household belongings arrive from North Dakota. The new Mountain Heights Apartments on Hiland Avenue in Burley are being offered for rent for $850 for a two-bedroom, two-bath apartment. This house, 1209 Boardwalk Ct. in Burley, is listed at $385,000. Built in 2003, it is 4,100 square feet and includes seven bedrooms and 3 1/2 bathrooms. This house, 2031 Z St. in Heyburn, is listed at $167,500. Built in 1975, it is 1,824 square feet and includes three bedrooms and one bathroom. This house, 1700 Conant Ave. in Burley is listed at $139,000. Built in 1915, it is 1,540 square feet with another 594 square feet of unfinished basement, and it includes three bedrooms and one bathroom. This house, 545 Terrace Dr. in Burley, asking price is listed at $655,000. Built in 1994, it is 3,542 square feet with another 1,111 square feet of unfinished basement, and it includes three bedrooms and 2 1/2 bathrooms. New Burley resident Katie Mitchell watches workers unload boxes and furniture on Aug. 30. in Burley. BURLEY — When Katie and Brad Mitchell moved to Mini-Cassia, they found a housing market that didn’t leave much room to be picky. Purchasing a home that met all of their needs was an impossible task, and finding a home to rent wasn’t much easier. On Aug. 30, Mitchell walked back and forth from her family’s new rental house in southwest Burley to a moving truck full of their belongings parked at the curb. Clipboard in hand, she checked off items that had safely arrived. The items had been on the truck for two weeks while the family patiently waited and slept on air mattresses inside their new rental home. “It was really hard to find a home that was clean and in a good neighborhood to rent,” Mitchell said. The Mitchells and their three boys, ages 4, 6 and 8, moved to Burley on Aug. 17 after her husband took a position at Double L Manufacturing Inc. in Heyburn. They originally planned to buy a home, but nothing was the right fit. The Mitchells’ experience is not uncommon. Despite a recent population and business boom, Mini-Cassia residents are finding that affordable housing, whether they’re renting or buying, is almost nonexistent. Since Terry became a real estate agent five years ago, houses for sale in Mini-Cassia have continually grown scarcer. But during the past year, she said, the market has tightened even more. She’s heard veteran agents discuss the days when there were 300 homes for sale. But for now, at least, those days are long gone. And a tighter housing market means more houses receive multiple offers. When those offers come in, money usually talks. But other factors might sway a seller’s decision, including how quickly the buyer is able to close the deal. The average number of days that houses remained on the market in Cassia County shrank from 69 in 2017 to 60 in 2018. In Minidoka County, houses stayed on the market for an average of 91 days in 2017. This year, that number fell to 58 days, according to the Intermountain Multiple Listing Service. Most families, Terry said, seek houses in the $130,000 to $180,000 range, and there are only about a half-dozen that fall in that category for sale in Burley. Rupert has 11 houses for sale in that range, but five of them are new construction that will not be finished until the end of January. There are nine homes in that range in Heyburn. More than ever, Terry said, home buyers need to work with a real estate agent who can watch the market for them in order to be successful in this competitive market. “I’ve had times where I’ve spoken with a client that wants to list a house and I have a client looking for one and I’ve been able to put them together before the house was even listed. You really need to have someone in your corner looking out for you,” she said. Houses in one Burley subdivision that’s under development will start at $197,000, which is more than many families can afford, Terry said. But even that is on the low end of available housing. More than half of the available homes cost $200,000 and up..
For families like the Mitchells, who could not nail down a home to buy, renting is often the backup plan. But the rental market in Mini-Cassia is even faster-paced than the buying market. Terry’s office keeps a list of rentals that are available in the area. The list typically includes about six to eight listings. People who are caught in the tight rental market should consider at least looking into the option of buying a home, she said, because sometimes a rent check costs as much as a mortgage payment. “I’ve had clients who didn’t think they could buy but when they checked with a lender, they found out they could. It’s worth it to at least check it out,” she said. So is relief for homebuyers on the horizon? Despite the tight housing market, city officials say new developers approach the city every day. The supply has yet to materialize, but there is demand from both prospective buyers and builders. “We have not seen housing growth slow down at all in the last year,” Kelly Anthon, Rupert city administrator said. In recent memory, Rupert was downright stagnant. Five years ago, the average age Rupert homes was 63 years old, one of the oldest averages of any city in Idaho. More than 200 homes are under development right now. A variety of housing, including duplexes and single-family homes, are being built. Much of the development is being done by outside investors, he said. In the meantime, a tight housing market is part of a natural growth cycle, Anthon said. “Growth happens through this organic process,” Anthon said. First jobs are created, and then it’s time for more places for people to live, Anthon said. Amenities and retail soon follow. Creating amenities and a place where people want to live and have a business are crucial parts of that cycle. 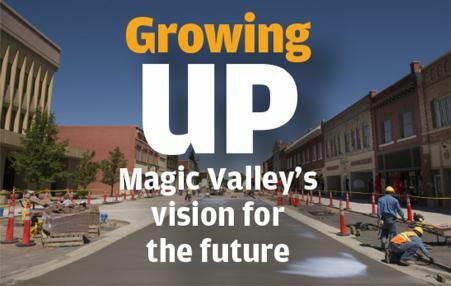 In the past few years, Rupert has opened a Boys and Girls Club of Magic Valley and is now in the process of revamping the Rupert Square. “The Square is a way of securing Rupert’s future. The city has always been identified with the Square. When you beautify the Square, Rupert is beautified,” Anthon said. Jan Roeser, a regional economist with the Idaho Department of Labor, said she’s surprised that there aren’t more newly constructed homes on the market in Mini-Cassia. It’s helpful for a community to have some extra housing to pull out of its “back pocket” for emergencies during a big company expansion or relocation, she said. Still, it’s not uncommon during a period of growth for a community to experience a lag in housing availability. But Roeser is confident that as the labor force continues to grow, available housing won’t be far behind. Part of the existing lag may be left over from the Great Recession of the late 2000s, she said, as Idaho’s construction industry has struggled to regain solid footing since then. “The construction industry has never really recovered its workforce,” Roeser said. The total number of non-farm jobs statewide in 2006 was 640,300 and in July 2018 that number rose to 740,000. Over the same span, the number of construction jobs dropped from 52,900 to 47,300, according to the Idaho Department of Labor. “I think those numbers are very telling, especially for our area,” Roeser said. Meanwhile, for families like the Mitchells who need to find housing, compromises are often necessary. The rental home they chose has three bedrooms and 1 ½ baths. It rents for $950 a month, and it has some problems. There’s not enough room in the kitchen for a table, so the family will use one of the bedrooms as a dining area. “But it was clean,” she said, and it has a backyard. While some towns are faring better than others, and businesses continue to boom, a lack of housing across Mini-Cassia could temper growth across the board. Homebuilding is up in Twin Falls. But is it enough to offset the region's tight housing market? TWIN FALLS – Realtor Tami Gooding could see the indecisiveness in her client’s eyes.